Following on from the previous release of two very enjoyable adventures for the Fifth Doctor and Nyssa, Big Finish's experiment with their release format continues with another double-bill of two part stories, this time featuring the Sixth Doctor and Flip. These are set prior to Flip's initial departure in 2014's Scavenger (from which she returned for last year's Quicksilver and will be heard again later this year alongside Constance Clarke). 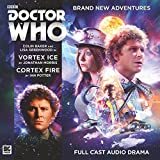 Vortex Ice by Big Finish veteran writer Jonathan Morris is an enjoyable tale which may cause a little confusion for listeners during the first episode due to a certain amount of "timey-wimey"ness as the story unfolds. However once the story moves into its second episode, the truth of what's really going becomes more apparent and the listener is rewarded for their patience. Colin Baker and Lisa Greenwood are joined by a competent supporting cast of whom the standout is Shobu Kapoor still probably best remembered for having portayed Gita Kapoor in EastEnders (and Dimensions in Time) who convincingly portrays the leader of an underground expedition. Overall this is an enjoyable tale although it possibly could have done with a slightly happier resolution. Unlike the previous (and following) release Cortex Fire by Ian Potter does not follow on directly from the first story but instead stands completely alone. It finds the Doctor and Flip having arrived on the futuristic and slightly dystopian city of Festin to witness an astronomical spectacle. However as they discover the truth behind the Cortex network which controls the city it becomes apparent that the entire population are in danger. This story also features a tight ensemble cast who are well directed by Ken Bentley including Eve Webster who voices several roles including the sinister Cortex. Fortunately, this is a more straightforward narrative and perhaps all the more enjoyable for being so. Both stories also benefit from excellent music by Joe Kraemer, with Vortex Ice having a traditional 1980s feel and Cortex Fire featuring a nice homage to the film score of The Empire Strikes Back. Overall this release features another enjoyable double-bill which shows that the range’s format deserves to be stretched occasionally. It also bodes very well for the next run of adventures featuring the Sixth Doctor, Flip and Constance beginning in October with The Behemoth. 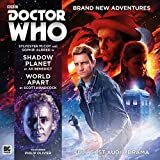 The double-bill trilogy concludes with the welcome reunion of the Seventh Doctor, Ace and Hex in Shadow Planet / World Apart .